An apprenticeship with sorrow invites us to learn the rites of grief and to practice a reverence of approach, as Irish poet/philosopher John O’Donohue suggests. He writes, “What you encounter, recognize or discover depends to a large degree on the quality of your approach… When we approach with reverence, great things decide to approach us.” How we approach our sorrows profoundly affects what comes to us in return. We often hold grief at a distance, hoping to avoid our entanglement with his challenging emotion. This leads to our feeling detached, disconnected and cold. At other times, there is not space between us and the grief we are feeling.We are them swept up in the tidal surge of sorrow and often feel as though we are drowning. 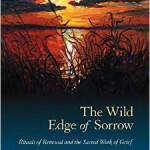 An approach of reverence offers us the chance to learn a more skillful pattern of relating with grief. When we come to our grief with reverence, we find ourselves in right relationship with sorrow, neither too far away nor too close. We have entered into an ongoing conversation with this difficult, holy visitor. Learning we can be with grief, holding it softly and warmly, is the first task in our apprenticeship. Approaching sorrow, however, requires enormous psychic strength. For us to tolerate the rigors of engaging the images, emotions, memories and dreams that arises in times of grief, we need to fortify our interior ground. This is done through developing a practice that we sustain over time, Any form will do – writing, drawing, meditation, prayer, dance or something else – as long as we continue to show up and maintain our effort. A practice offers ballast, something to help us hold steady in difficult times. This deepens our capacity to hold the vulnerable emotions surrounding loss without being overwhelmed by them. 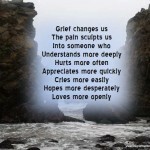 Grief work is not passive: it implies an ongoing practice of deepening, attending and listening. It is an act of devotion, rooted in love and compassion. One of the most essential skills we need to develop in our apprenticeship is our ability to stay present in our adult selves when grief arises.